Year after year, commencement speakers face crowds of graduates and offer words of wisdom, reassurance, and reminders of the difficult challenges ahead, and this year was no different. Speakers ranged from Barack Obama and Condoleeza Rice to Andy Samburg and Aaron Sorkin. 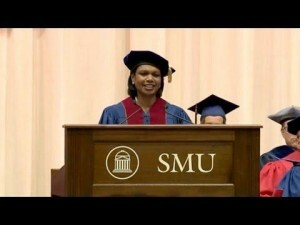 College graduates were given a final speech of encouragement before heading out into "the real world." Wendy Kopp, Dartmouth College: "We have to check ourselves every day and ask 'Is the net force of what I'm doing building up or tearing down?'" Aaron Sorkin, Syracuse University: "Every once in a while you'll succeed. Most of the time you'll fail, and most of the time the circumstances will be well beyond your control." Michael Lewis, Princeton University: "Recognize that if you have had success, you have also had luck, and with luck comes obligation." Ira Glass, Goucher College: "We don't know. We lurch forward in our lives, we try this, we try that, we make the best guesses that we can, based on what we believe at the time." Barney Frank, Harvard College: "What good are a set of ideals that are unrealized? Make sure that you are pragmatic in the service of your idealism." Corey A. Booker, Bard College: "I believe in my heart of hearts that it is better to have your ship sunk at sea than to have it rot in the harbor." Click here to hear their inspiring speeches. College Essay Organizer's Essay QuickFinder is FREE! Get access to every essay question you'll need to write this year, including supplemental, scholarship, optional, and program-specific questions you won't find on the Common App -- all organized in one place! Click here to select your college list and create your Student account. It takes just a few seconds. Upgrade to an Essay RoadMap account to organize your essays and see how many original essays you need to write, enter promo code twitter2012 for 50% off. This offer applies only to high school seniors - no counselors. Each student gets only one account. All students who create their accounts will be eligible to enter our Best Essay Contest and win up to $500 cash! It may seem daunting, but it doesn’t have to be. Making that initial move to start the college search process is the most crucial. Here are a few suggestions on how to do that. Imagine where you want to live for four years. Imagine the city, the town, the surroundings, the neighborhood parks, the types of culture and people, and the scenery. Where would you see yourself happiest for four years? Is it somewhere you are familiar and comfortable with? Or maybe it’s somewhere altogether different. Traveling somewhere new is always exciting. Write down your ideal locations, and search for colleges in those places. Where can you continue doing the things you love? Many of us during high school find ourselves in some sort of niche, a comfortable environment to do the things we feel most passionate about. Whether it is a sports team, student government, community service groups, honor societies, math and science teams, school play and theater production, robotics team, religious gatherings, Model UN, speech and debate teams, or any other groups, many of us are defined by way more than academics. How would you like to continue doing these activities in college? You may be thrilled at opportunities to keep doing what you love and what you do best. You may also be itching to try something new. In any case, you have a horizon of opportunities in front of you, and the right college will allow you to continue to follow your passions. Don’t be. College is exciting. What people say about college being the best four years of your life is true! There is so much to look forward to. 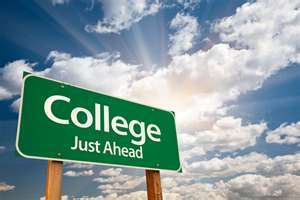 Check out our partner unigo.com to jumpstart your college search today. College Essay Organizer was at the Higher Educational Consultants Association (HECA) yesterday located at the Hamilton Park Hotel and Conference Center in New Jersey (Dan's home state). We made the commute from Manhattan (wondering how some people make that drive each day), and thoroughly enjoyed the company of both new and familiar consultants and fellow vendors. The morning flew by, and we were looking forward to typical drab hotel-food lunch, yet we were pleasantly surprised to find that the cuisine was truly exceptional. Dan is still talking about the salmon. Seriously. After filling up, we returned to our table, enjoying the rest of the afternoon. The college/vendor fair hosted by Drew University was the highlight of our day, and the time passed quickly as we chatted with dozens upon dozens of consultants eager to learn more about College Essay Organizer. Unfortunately, we had to dash before the wine and cheese reception, but we heard that those HECA members sure know how to have fun! Looking forward to the next conference. HECA members can enter the promo code heca2012 and receive an additional 10% off of their purchase. Do computers and people think alike? "This spring, the William and Flora Hewlett Foundation sponsored a competition to see how well algorithms submitted by professional data scientists and amateur statistics wizards could predict the scores assigned by human graders. The winners were announced last month — and the predictive algorithms were eerily accurate." Even Educational Testing Service, which develops and administers the SAT, created e-Rater, a software that can grade 16,000 essays in 20 seconds, according to this article. We at College Essay Organizer designed an advanced algorithm a few years ago showing how all your colleges' different essay questions overlap, allowing you to write the fewest essays possible. Our easy-to-use website now benefits thousands of college applicants and independent consultants looking to gain the competitive edge and work smarter. Why rush through writing 20 mediocre essays when you can instantly see how to write, say, just 4 exceptional ones? Don't think you have that many essays to write? See for yourself here -- it's FREE. 1. Create an Initial College List. Introduce your student to College Essay Organizer by putting colleges on her list, knowing that this list will likely change a bit in the weeks and months ahead. Explain that her RoadMap is where you will do all your college essay work together, from beginning to end. Highlight that it will provide all the essay questions, map out a personal strategy for writing the fewest essays possible, and allow you to share and edit drafts. 2. Brainstorm. Send out brainstorming questions to gather raw info about your student. This stage is all about encouraging your student to express herself freely. It is perhaps the most important part of the entire college essay process—without great ideas and details, the essay topics will be bland, and bland topics inevitably breed bland essays. Tell the student to upload her brainstorming (as a Word doc) under “Add File” next to the Common App Personal Statement, and to then click the Alert symbol and then “Email My Alerts to Counselor.” On your end, you will now see “View File” next to the Common App Personal Statement; download the file and review it on your end. Make notes as needed, upload your new file, and alert your student to review your comments. This is a good introduction for both of you to the process of uploading drafts and using the alert system; it will allow you to save hours of time and avoid confusion as you eventually deal with multiple drafts for multiple questions and colleges. 3. Assign Focused Free Writing. Once you’ve gotten the brainstorming back from your student, you’ll likely have to follow it up with questions that delve deeper into promising topics/themes. Ask her “why” or “how” in order to get more info. For example: “You say you love physics, but don’t go into detail. Tell me why. How do you plan to pursue this passion? Give me specific examples of any relevant experiences.” Again, have the student post this new focused free writing file to the Common App Personal Statement and alert you when ready. 4. Outline. Now that you have the student’s raw, detailed thoughts, it’s time to figure out which topics will work for all the different essays. This is where College Essay Organizer comes into play. Simply reference each student’s RoadMap to determine the specific topics for each of the required essays. For example, if the RoadMap calls for an essay about community, click the orange “See Applicable Questions” button to view the different questions that you can use this community-related essay for. Reading the different questions first will help you determine what direction you can go in for that particular student. The exact essay direction will be based on the student’s unique community-related experiences or ideas, and the various questions that may ask about a specific aspect of community. The student should then write one community-themed essay that addresses all of the different questions (with some modification if needed). Now that you and your student are referencing College Essay Organizer, you can encourage the student to read the essay samples posted on the RoadMap. These samples will help your student understand the nature of a college essay, which is typically very foreign to applicants. 1. Create and Complete the Common App. It goes live August 1. Have your student create her Common App account and fill out all the pages. Upload the essays in their proper places on the application. 2. Complete the Supplement Forms. Have the student add all the colleges she is applying to and fill out all the basic info on their supplement forms (leaving the essays to be dealt with separately). 3. Customize Each Student’s RoadMap. As the colleges are updated with the new essays for this season, the asterisks will be removed in front of the college names on the RoadMap under “Review These Questions To See If They Apply To You.” For any updated college (it will not have an asterisk), you or the student can go through all questions to ‘Remove’ those that are not relevant to that student (you can add them back if you change your mind). This way whenever you or the student logs into the account, you’ll see all the questions, and only the questions, that the student has to deal with. 4. Work on the Supplement Essays. Now that the Common App Personal Essay, the short activity essay, and the Intellectual Interest essays have been completed, and the new supplements are being released, you can turn to the other essays on the student’s RoadMap. You can go by college (i.e., dealing with all the essays that University X requires—this is a good approach if the student is applying early) or you can go by essay (i.e., reference the essays assigned in the RoadMap and write, say, a community essay that can be used for multiple questions, modifying it as needed for each individual question, and then move on to the next assigned essay). 1. Track Your Progress. Check off “Complete” next to each essay question so you can quickly see what’s finished and what’s left. You can un-check this box at anytime. 2. Work Smarter and Love it. Continue to work on the different drafts, especially for any early decision/early action/rolling decision colleges, and let College Essay Organizer notify you when any slow colleges have finally released their new application questions. Enjoy knowing that all your students’ essay plans and drafts for all their different questions are organized cleanly in one place—one less thing to worry about now that crunch time has arrived. We've implemented a number of exciting upgrades this year for educational consultants. Please read the newly updated Master Account User's Manual visible in your Master Account. You can view the manual without logging in here. It highlights the new RoadMap enhancements and the co-branding feature so students can see your company logo when logged into their accounts. As always, we're here to help, so please don't hesitate to email us at [email protected] if you have questions about the new feature or if you would like us to walk you through it.